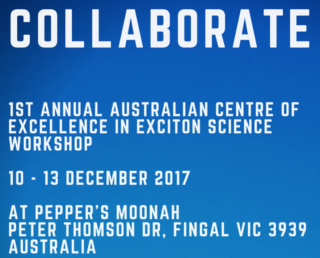 The 1st An­nu­al Aus­tralian Re­search Coun­cil Cen­tre for Ex­cel­lence in Exci­ton Sci­ence aims to bring to­gether our mul­ti-dis­c­pli­nary team of re­search­ers to dis­cuss, en­gage, dis­cov­er and learn how the Cen­tre in­tends to achieve bet­ter en­er­gy ef­fi­cien­cy. The Build­ing Art In­ven­tion re­search group at the de­part­ment of Ar­chi­tec­ture, Ur­ban- and Land­s­cape Plan­n­ing, Uni­ver­si­ty of Kas­sel, Ger­many conducts re­search at the in­ter­sec­tion of vi­su­al arts, ar­chi­tec­ture, ur­ban plan­n­ing, in­dus­trial- and in­ter­ac­tion de­sign, ex­per­i­men­tal physics, dig­i­tal fab­ri­ca­tion and ma­te­rial sci­ence and ap­plies that knowl­edge to ar­chi­tec­ture, span­n­ing the full range from nanome­ter to build­ing scale. Cur­rent re­search con­cerns the de­vel­op­ment of high­ly in­no­va­tive func­tio­n­al build­ing ma­te­rials and con­cepts, such as ‘Touchcrete’ (touch-sen­si­tive con­crete), ‘Blingcrete’ (retro-re­flect­ing con­crete sur­faces) and ‘DysCrete’ (en­er­gy gen­er­at­ing con­crete). The lat­ter en­tails the in­te­gra­tion of dye-sen­si­tized so­lar cells (DSCs), an emerg­ing thin-film pho­to­vo­lat­ic tech­nol­o­gy, in­to pre­fab­ri­cat­ed con­crete seg­ments. Ar­eas of ap­pli­ca­tion in­clude ar­chi­tec­tu­ral and prod­uct de­sign, as well as dig­i­tal fab­ri­ca­tion and con­struc­tion.